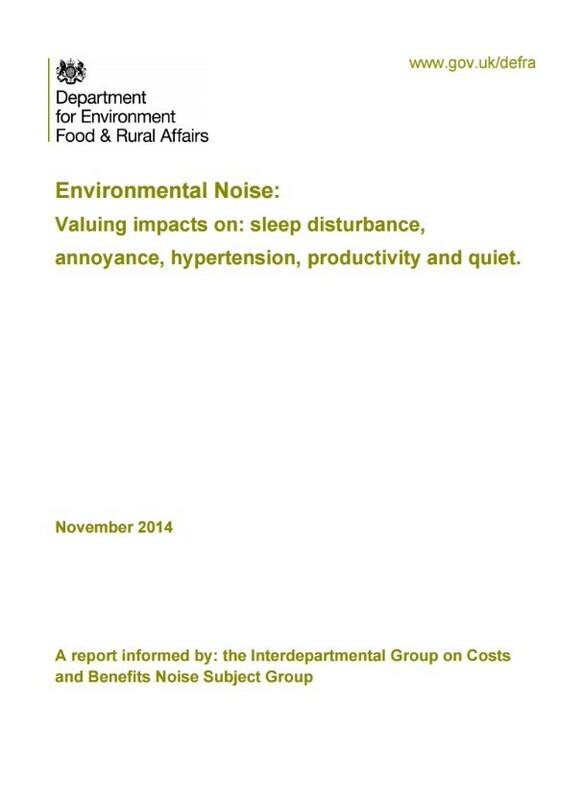 Defra has published a report informed by the Interdepartmental Group on Costs and Benefits Noise Subject Group (IGCB(N)) entitled 'Environmental Noise: Valuing impacts on: sleep disturbance, annoyance, hypertension, productivity and quiet'. This contemporary Government position details current understanding of the links between environmental noise and various effects including sleep disturbance, annoyance, hypertension and related diseases. It also includes some commentary on productivity and the value of quiet areas. The purpose of the report is to update the Government's economic appraisal method for transport noise allowing the social costs of noise to be quantified and managed. Defra suggests that a key challenge in managing the noise environment from an economic perspective, is to balance the costs of noise with the costs of controlling noise. The document purports to have considered the latest developments in the literature including the results of Defra commissioned research to address specific gaps identified on hypertension, quiet areas and productivity. (5) A method is recommended for valuing impacts on quiet areas, where sufficient evidence is available. Various methods for calculating the value of noise are presented for the 5 principle areas covered in the report, based upon consideration of a series of dose-response relationships. These are split according to road, rail and aircraft transportation sources where appropriate. The full report can be downloaded here.